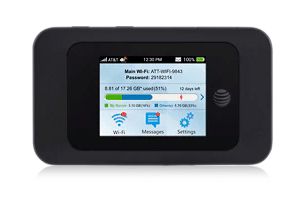 Compact, portable, and easy to use, the AT&T Velocity 2 mobile hotspot helps keep you connected and online through the AT&T mobile 4G LTE1 network. Connect up to 10 wireless devices, including laptops, tablets, mobile phones, e-readers, TVs, and more.2 And safely share your connection using the Guest network, which provides restricted, highly secure access with a separate password. Highly secure. Get peace of mind with password protection and highly secure Wi-Fi® access. Use the AP Isolation security feature to block access between the connected devices. Easily portable. Conveniently take the compact Velocity 2 with you when you're on the go. Whether traveling for business or pleasure, you'll have a flexible and dependable way to connect. Simply power it on and connect—it's easy to get online in no time at all. With Velocity 2, you can access the AT&T mobile 4G LTE network almost anywhere in the United States and Mexico. Long battery life. Keep your devices connected for up to 10 hours with the powerful 3000mAh battery.